Use to grow flowers, fruit, vegetables and trees. Bracken provides natural potash essential for fruit and flowers, whilst wool contains slow release nitrogen and retains water. 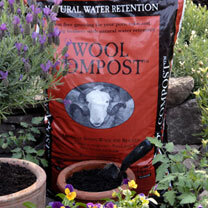 A real alternative to peat - and with a similar soft texture. Made from totally renewable resources with great environmental benefits to help you garden more sustainably. Made in the UK, 100% British. High potash content. Available: 30 litres x 1, 2, 20, 30 bags. About Grochar: A modern take on a 2000-year-old tradition, GroChar was inspired by Amazonian Indians who used charred plant matter to enrich their poor, infertile soils. It is produced in the UK by a patented, clean technique which captures up to 70% of the carbon that would otherwise be released into the atmosphere by burning or decaying. It remains in the soil almost indefinitely, improving soil structure and water penetration, helping retention of nitrogen and continuing to absorb additional carbon from the air. Enriched with mycorrhizal fungi, seaweed and wormcasts, to provide a strong fertile base for plants to flourish. Carbon Gold has been developed by Craig Sams, founder of Green and Black's Chocolate. Craig has a long record of commitment to organic food and farming practices. He founded Whole Earth Foods in 1967 and is a former chair of the Soil Association.